We control the horizontal; we control the vertical. Kalamazoo Uber driver and shooting suspect Jason Dalton’s story of being possessed by the Uber app is only the latest in a long history of such stories, in which people have attributed paranormal or spiritual powers to new technologies. Tales of otherworldly beings communicating through the telegraph, radio, television, or computer screen are motivated by the anxieties that arise with social and political changes driven by new forms of communication and action-at-a-distance. Today, while Uber’s PR department scrambles to keep the phrase “going Uber” from becoming an updated version of “going postal,” it is worth looking more closely at Dalton’s delusions for some insight into the particular fears and dreams of our up-and-coming app-governed existence. how can you talk with someone who isn’t present? how can these images seem so real when we know they are not? how can we make sense of this invisible power that flows all around us, and through us? We may laugh today at people being afraid of telephones and radios, but Dalton’s story owes more than a little to contemporary cultural anxieties over the increasing saturation of our lives with apps designed to influence, and to some extent to control, human behavior. Though exaggerated by his paranoia, each of Dalton’s crazy claims reflect the actual controls and suggestions made by the real Uber app. 1. Dalton saw an “Eastern Star” or “devil head” in the app. 2. The app triggered Dalton's actions with colors and sounds. 4. Dalton felt that the app was telling him where to drive. 5. Dalton felt that the app gave him special abilities or protections. 6. Through the Uber app, Dalton felt connected to some greater, inexplicable power. Each of the quotes below (in italics) are from the interview notes made by officers Moorian and Ghiringhelli, and made available by WZZM in Kalamazoo. Dalton said that if we only knew, it would blow our mind. Dalton then explains how when he opens up the Uber taxi App a symbol appeared and he recognized that symbol as the Eastern Star symbol. Dalton acknowledged that he recognized the Uber symbol as being that of the Eastern star and a devil head popped up on his screen and when he pressed the button on the app, that is when all the problems started. 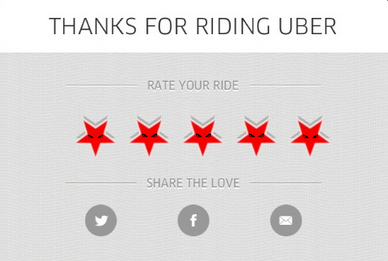 Uber did just change its logo, but neither the old nor the new logo matches the “devil’s head” described by Dalton. Nevertheless, as Uber drivers have already started pointing out over at uberpeople.net, there are in fact upside-down five-pointed stars (as well as rightside-up ones) all over the background of the newly-designed app. Dalton seems to have fixated on this. 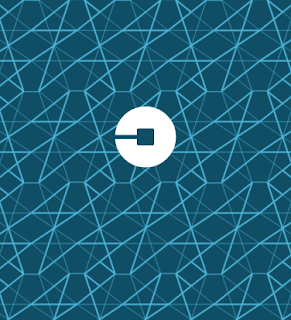 TruYouber: Sure, the new Uber app is covered with up and down-facing pentagrams. But isn’t it more disturbing that it is clearly modeled after the logo of the world-conquering corporation in the dystopian Dave Eggers novel, The Circle? It was not enough for the devil’s head logo to simply be there: Dalton himself had to speak its name for it to take power over him. When he recognized the symbol and “spoke what the symbol was,” it responded (he claimed) by turning from red to black. Dalton said that when the Uber symbol is red, it is just picking up and dropping off people, but when he recognized the symbol and spoke what the symbol was, the color changed from red to black. Dalton said he wishes he would never have spoken what that symbol was when he saw it on his phone. Dalton described the devil figure as a horned cow head or something like that and then it would give you an assignment and it would literally take over your whole body. Dalton said that if he wouldve never ever mentioned the Uber symbol resembling the Eastern Star, he never wouldve had any problems. Dalton was asked what was different tonight from the other nights and he said as a driver partner with Uber, the icon is red and it had changed to black tonight. The red-to-black shift which Dalton reported seeing is a bit harder to explain. On a normal, non-possessed Uber driver app, the screen does go black—right before a ride request, after which the screen zooms in on a blue circle centered on the hailer’s location, while a ringing/beeping sound alerts the driver to touch the screen to accept the ride. Dalton reported such beeping when the app was taking control of him. I asked Dalton why the system allowed him to stop for the officers and Dalton said that he didn’t know. Dalton then told us that he did know one thing, that when the system switched from black to red and when the officer was about to say something to him it went beep beep beep for Dalton to log back into the system. ... Dalton said that when the system switched back is when Dalton got his presence back. The Uber app is, of course, designed to influence driver behavior through the control of information, and through certain visual and audio cues; and Uber does have a history of experimenting on driver behavior by tinkering with the app. Nevertheless, it is probably safe to assume (barring further revelations) that Dalton hallucinated this whole red-to-black shift. Dalton said that as soon as the police officer stopped him tonight, the symbol went from black to red and he felt like he was no longer being guided. Dalton said that was the reason he didnt shoot the officer because the app went from black back to red. Dalton explained that when the symbol turns to black, it literally has control over you. I asked Dalton why didnt he just uninstall the app and he said it sort of had you at a certain point. Dalton said it also told him to be available all the time. ...he said it wasnt like a telling, it was more of like a control. ...Dalton said that Uber requires a driver to have a car newer than 2007 and when you plug into it, you can actually feel the presence on you. Significantly, Dalton said that the app didn’t tell him what to do; it rather took control of him through a sort of feeling of presence. This makes sense, because this is just how algorithms influence human behavior, by feeling or intuition, rather then “telling” per se. Paranoias about receiving instructions are so last century—befitting antiquated technologies like radio or television. Today, instead of being given instructions, we rely on algorithms working in the background to guide our behavior; apps like Uber work like video games, by giving users a circumscribed freedom of action within which we intuit or “feel out” the algorithms which assign value to our actions. McKenzie Wark calls this an “intuitive relation to the algorithm;” the most successful game players, or Uber drivers, are those who have “most fully internalized” the algorithm. Dalton certainly internalized the algorithm; unfortunately, he seems to have confused Uber’s taxi game with a FPS. Dalton said that he could only tell us that it has the ability to take you over. We confirmed with Dalton that he was referring to the Uber app and Dalton said yes. Dalton then told us that it feels like it is coming from the phone itself and he didnt know how to describe that. ... Dalton said that as he was sitting there with us, it was almost like artificial intelligence that can tap into your body. Dalton then said that is why he is trying to tell us it is like an artificial presence. Dalton said that it would take you over to the point that you are like a puppet. This one is hardly surprising. Uber driver apps are automatically integrated with Google Maps or with Waze, and while Uber drivers are not technically required to use and follow GPS, they are strongly encouraged to do so. Dalton seems to have interpreted this suggestion as mandatory. I asked Dalton where he was headed when he was stopped and Dalton said that the system was telling him to drive. I asked Dalton if he knew where it was telling him to drive and Dalton said that the system was literally telling him to just take turns (as he made a motion with both hands on a steering wheel making turns). Dalton said that it starts out that you have to follow the navigation, but it gets to the point where you dont have to drive at all, the car just goes. Dalton said that as long as you have a 2007 or newer car, your phone can link through your car. Great news for driverless car fans: there is no need to wait five or ten years for scientists to develop self-driving cars when Uber can achieve the same effect right now through the magic of spirit possession! This is one of the most interesting aspects of Dalton’s story. Just like in any deal with the devil, you lose control of yourself, but you gain certain perks in return. Dalton then told us that when the app would turn from red to black and it was a 5 star driver that is when it was telling you you could drive just as fast as you wanted to. This tallies with the stories told by several of Dalton’s passengers, that he drove insanely fast, and blew through stop signs and stoplights. The app, apparently, was giving him superhuman driving powers and privileges. Dalton said that the Iphone can take you over. Dalton explained how you can drive over 100mph and go through stop signs and you can just get places. Dalton explained how there is a customer service score on Uber and when he tapped the button, he could say anything he wanted to about the person and it would be anonymous. Dalton then said that he could hear other peoples phones ding and their score or rating would go down. Dalton said he was seeing himself from outside of his body. Dalton said that this thing knows where everything is through your phone. Dalton said that it knows everything and when I asked what it was he said whatever Uber is attached to. Dalton said that there is something bigger than Uber just picking up people and dropping them off. Isn’t this exactly what Uber’s CEO has been claiming all along? Dalton then told us that he is not a killer and he knows that he has killed. Let’s go out on a limb here and assume that the Uber app did not make Dalton shoot all those people. He did it himself. He was bonkers, and confronted with the horror of what he himself had done, he rejected his own actions and blamed them on the conveniently available construct, the “app.” Which we all know to be an uncanny, and untrustworthy, interloper in our social relations. Jason Dalton thought he was being controlled by the app, but, in truth, he had split himself in two—one half a helpless puppet, haplessly looking on while the other half, the ghost in the machine, wrought mayhem. Or maybe it wasn't Dalton who split himself in two. The very working of the app involves the tracking and profiling of a "data double," a spectral data-Dalton corresponding to the human Dalton, and through which the human Dalton can be tracked, profiled, and manipulated. And Dalton isn’t the only person having trouble telling where his own actions end, and algorithmic controls begin. Apps like Uber (and Google, Instagram, etc. ), through which algorithms massage us, are popular because we embrace the controls they exert on human interactions. They really do seem to know everything, or at least a lot of things. They promise us great new powers, at a (Faustian) bargain. In Uber’s case, the app provides a preprogrammed set of social roles—driver, passenger—into which actual humans can be plugged-in, interchangeably. The app promises freedom, while delivering stress, exploitation, and constant surveillance. Both YouTube and the news are full of videos of drivers having "Uber meltdowns" in which they quit the job, often spectacularly—though thankfully, not as bloodily as Dalton did. Dalton's tale opens up all kinds of hauntological questions about the dawning algorithmic era. To what extent was it all his own paranoid delusion, and to what extent the new experience of app-enabled alienation? Haunted by our data shadows, all of our senses of individuality and identity, of agency and responsibility, may be scrambled and shuffled by the rollout of socially mediating algorithms. Will we recognize the future that is created as our own doing, or attribute it to the grotesque ideas of an algorithmic brain?